The local electrostatic field at sharp field emission tips is key to answer fundamental questions of how the field interacts with these tips. Despite a long history of study, three-dimensional (3D) electrostatic fields at nanometer resolution around sharp tips have not been experimentally quantified. Since the electrostatic fields in electron field emission and atom probe tomography (ion emission) are extremely strong and spatially extended, no technique was able to adequately provide the resolution or a large enough field of view in a quantitative manner. 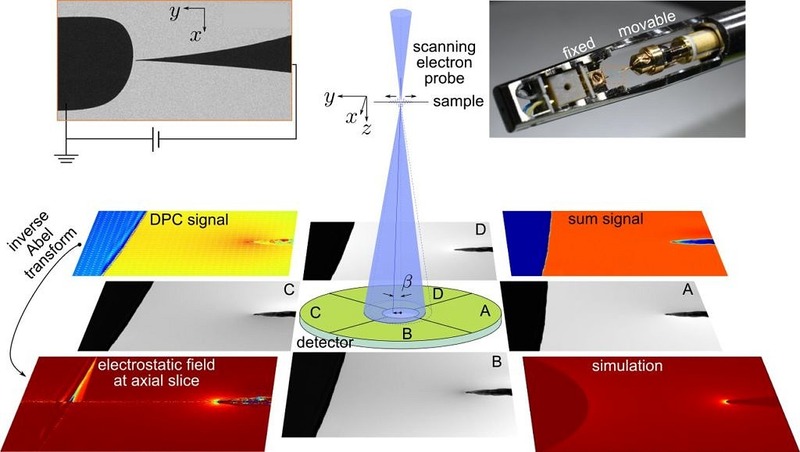 In a recently published article in Applied Physics Letters, Mingjian Wu, Alexander Tafel, Peter Hommelhoff and Erdmann Spiecker from IMN and Institute of Laser Physics used a special scanning transmission electron microscopy technique to reveal the three-dimensional electric field and quantify it in excellent agreement with computer simulations. The paper appeared as Featured Article (Editor’s choice) and illustrated the front cover of the 1st issue of Applied Physics Letters in 2019. In this work, an ultrasharp tungsten nano-emitter was created for the experiment with standard electro-chemical etching and plasma etching in an ultra-high vacuum chamber. This nano-emitter was mounted in a in situ TEM holder setup, to reach field emission condition. Using differential phase contrast (DPC) in scanning transmission electron microscopy (STEM), the researchers were able to measure the electron beam deflection, to high precision, around the electron nano-emitter at nanometer resolution and micrometer field of view. From a single projection measurement of such electron beam deflection, a method was derived based on the inverse Abel transform to reconstruct a slice of the 3D electrostatic field. When the experimental results were compared with simulations based on a finite element numerical Maxwell equation solver, they were found to be in excellent quantitative agreement. In contrast to previous techniques based on electron holography, problems with reference waves distortion are circumvented in DPC enabling straightforward interpretation of the data. DPC also allows for a balance of field of view with resolution as well as an easily calibrated signal. We believe the technique will also be applicable to other systems such as studying fields around tips of general shape, if a series of measurements for different tilt angles can be taken.